Michael Solomon has produced documentaries, commercials, music videos and industrial films, with directors Albert Watson and Spike Lee, among others. 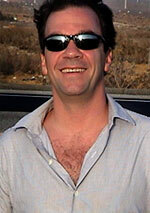 He has also produced music and film shows for Italian television (RAI, Canale 5, Studio Universal and Telepiu'). He recently completed work on Constantine's Sword, a feature documentary directed by Oren Jacoby, about the history of anti-Semitism and religious violence. He is currently in pre-production on a narrative feature about climate change. Solomon was born in Brooklyn, NY, and graduated from the University of California, Santa Barbara.